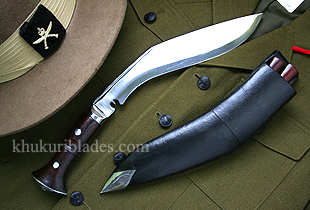 Based off our famous "Historic" khukuri, this model is the improved version. With the introduction of a flat tang blade, this kukri is stronger and more robust than ever. The Historic (Improved) traces its lineage back to the Mk II, which was in production from 1915-1944. It was this blade that struck down the Gurkha's enemies in both world wars. The handle is held onto the sturdy flat tang by two rivets, for excellent strength. During World War II, England could not make enough of these for the Gurkhas and so they were also made in Dehradun, India. This kukri was so successful that the famous US group Merrill's Marauders adopted it as well for the Burma Campaign.